"It is said that it is the victors who write the histories of wars, so it is especially revealing to discover a book that was written from the viewpoint of those on the losing side. Although it is known that Allied airborne forces landed into a German buzz saw on D-Day, far less is known about the troops they encountered on that dark night of June 6, 1944. One of the formations they encountered was a similarly elite group of paratroopers, who instead of dropping from the skies fought on the defensive, giving their Allied counterparts a tremendous challenge in achieving their objectives. This is the complete wartime history of one of the largest German paratrooper regiments, Fallschirmjäger 6, from its initial formation in the spring of 1943 to its last day at the end of the war. With numerous firsthand accounts from key members, they describe the events of 1943-45 vividly and without compromise. These accounts reveal previously unknown details about important operations in Italy, Russia, on the Normandy Front, Belgium, Holland, the last German parachute drop in the Ardennes, and the final battle to the end in Germany. With over 220 original photographs, many from private collections and never before published, this book fully illustrates the men, their uniforms, equipment and weapons. 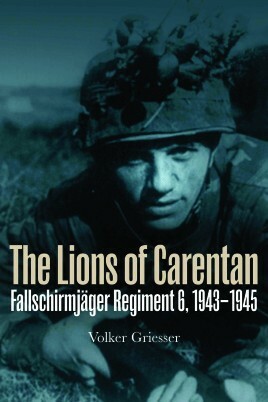 This work will inform readers of the full record of Fallschirmjäger Regiment 6, and why the Allied advance into German-held Europe was so painstaking to achieve.